IP-PBX, implemented using Streamco Smartswitch can give a fast variety of complex and useful features to the enterprise, such as Call Forwarding, Call Transfer, Call Recording, IVR, etc. 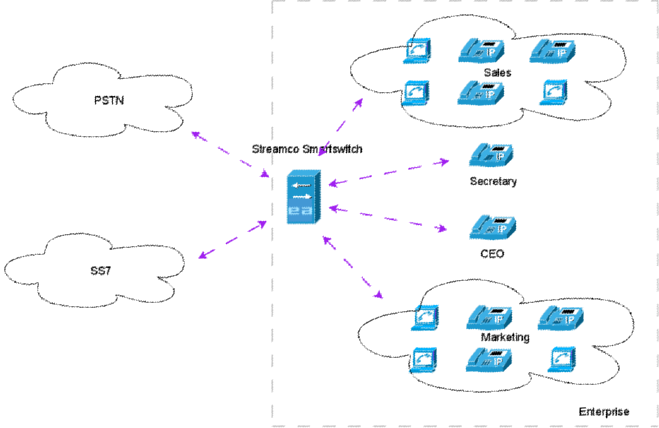 Additionally, due to operator functions of Streamco Smartswitch, the one can use its hunting and billing capabilities in cases when connecting to several (VoIP) providers simultaneously. For instance, you can use LCR (Least Cost Routing) feature of the system, thus reducing the telephony costs for the whole organization. integrated billing will enable you to check invoices from your providers. Enterprise uses Streamco Smartswitch as a PBX system. Calls from the outer world are answered by a Secretary. She transfers calls to CEO or to one of the departments. Members of Sales Department can reach each other or members of Marketing Department dialing the known extensions. Everyone can make calls to the outer world via trunks.